A long time ago we introduced the system for improving the your character's powers: Augments and Refinements. Today we're going to take a closer look at how these improvements work. Improves the base damage done to the opponent’s health. Improves all forms of control such as Aversion, Charm, Disorient, Fear, Hold, Immobilize, Reel-In, Repel, and Taunt. Typical Debuffs, which affect the following: Accuracy, Damage, Defense, Evasion, Resistance, Subtraction, Regeneration, Power Recovery, Healing, Power Depletion, Momentum Max, Health Max, Power Max, Awareness, Miss Rate, and Range. Typical Buffs, which affects the following: Accuracy, Damage, Power Recovery, Power Replenishment, Power Max, Regeneration, Healing, Health Max, Momentum Gain, Movement, Range, Crit Rate, and Awareness Max. This is a buff that affects Defense, Evasion, Resistance, and Subtraction. This improves the Area of Effect of a power. Now that we know what they do, let’s take a look at how. When we make a power in our Power Designer system, we start off with a value called a Power Rating. This Power Rating goes through a series of modifiers for each aspect of a power, such as the base accuracy, the commonality of damage type, the area of effect, duration and so on. Once the power is designed we end up with a value called Output. By now you may be wondering why all the trouble? Each pipeline, or formula for Output, is designed to provide its own form of diminishing returns. When powers are improved by Augments or stacking of effects, they follow the Output formula. Output is fed through a pipeline based on the power’s effect. Damage goes through the damage pipeline, Resistance goes through the Protection pipeline, and, well you get the idea. The pipeline applies a conversion formula which results in the final in-game value of the effect. For example, a Protection Power, let us say this is a Physical Resistance power, has an output of 3. For a Primary Power, this Output results in 6% Resance. If you were to have another 3 output, or a 100% improvement, you have 6 output, or 10% Resistance. The more Output applied through the effect pipeline, the higher the in-game value is up to a point. As you can see, doubling the Output from 3 to 6 didn’t result in doubling the in-game value from 6%. A power’s effect Output is improved by the combined percentage value of the Augments applied to the power. If you apply 2 +25% Augments for a 50% improvement, the effect of the power will have its Output improved by 50%. Don’t worry, we'll make sure you can see the real potential results for any augment you're considering. The Augments you earn will have a level to them. The Augment’s level is checked against your character’s level and if you are over or under the Augment’s level, the improvement bonus will be adjusted. The adjusted value is based on a curve which starts off gradual and then declines sharply for both going over and under the level. You won’t have to immediately replace Augments when you out level them, and will always receive some bonus from them. For example, if your level is increased by joining a team, causing you to temporarily outlevel your Augment, you won’t be high and dry. Of course your adjusted level will affect how your powers perform as well. When you Plan an Augment (that is crafted - we will get to that in time), you won’t have to worry about adjusted Augment values. This is especially important for when you get to make the Augments carrying Refinements. Reduces the cost for using a power. Reduces the recharge time of the power. Reduces the time required to passively charge a power. Improves the chance to score a critical hit. Increases the range of the power. Refinements get placed into an Augment’s Refinement Sockets. Basic Augments don’t provide them, so you will have to craft them through Planning or deal in the player market for them. Refinement Sockets are also where you will get to place any special procedural random occurrence Refinements (more commonly known as Procs). This is for balance reasons, so you don’t have to weigh the Proc against an Augment, and also gives incentive to get better Planned Augments with more Refinement Sockets to use up. These improvements don’t affect your power’s Output - they are applied after Output is calculated. You will see the value and how your power would be affected by socketing the Refinement. Now some of you power gamers out there automatically leap to the conclusion that it is only worth placing a Proc into powers with a fast recharge time. After all, the more often you use a power, the more of a chance of occurrence, making it ultimately much more effective. But leaving that as true would make things too boring. It’s never good for there to be one true best way to do anything. We wanted there to be more to think about when it comes to Procs. To achieve this, we begin by looking at PPPM, or probable procs per minute. How often do we want to see this proc happen? We then give it a base rate, say a Proc has a 25% chance to occur in 1 minute of use. This chance is then adjusted by the power’s recharge time. If the power has a long recharge time, say 180 seconds, it is practically guaranteed to occur. Slot it into one of your super fast recharging powers that you can fire off every second, and the chance diminishes accordingly. This creates an equilibrium of sorts for deciding how and where to place procs instead of always defaulting to the faster powers. There is also another type of special Augment. In the past, we’ve referred to them as Power Set Augments. Power Set Boosters affect all the powers in a Power Set. This can be an effect added to all the attacks or a buff that improves your protections. There is another type of Booster, a Global Booster. These would be placed in Tertiary Set Booster Sockets. A Global Booster affects all of your character’s powers. An example of this may be something along the lines of a Global Recharge Booster improving the recharge rate of all your powers. The trade off here is you can only access so many Tertiary Sets, 5 to be exact. This inherent limit allows us to fine tune the value of bonuses provided through Global Boosters. Take both the trade off in having to choose different Tertiary Sets, setting proper values, and how Output is calculated, and we have many ways to ensure both progress in maximizing your character’s capability while keeping a good eye on power creep through improvements. 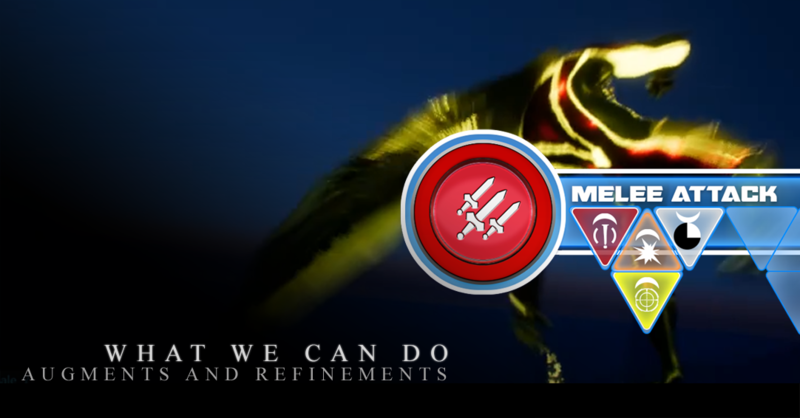 Between Augment Sockets being selected and applied at given level intervals and the power to craft Augments to obtain Refinement sockets, we give you plenty of ways to apply improvements to your character. But what happens if you come along and find something better and that socket is already occupied? We don’t want to make swapping Augments and Refinements a chore. We also can’t have people stopping mid-battle to swap out improvements to optimize themselves either. That could lead to a sense of required slow down to combat and unnecessary management. One way is to simply replace the old improvement with the new one, destroying the old. But when you want to keep the old as well as replace it, we have a plan. There will be two ways to swap out your improvements. One way will be to run a repeatable Plot to earn a drop to Unsocket an Augment or Refinement. The other is to purchase Unsockets from the cash shop with Stars. This way you can choose what works best for you. You can save your game time for more play time by buying the Unsockets. Or, if you have the time and don’t want to spend Stars, a player can earn their way to swapping improvements through in-game content. The entire system, from how you earn and can apply Augment Sockets (Basic Augments are easy to get), what it takes to craft Augments to get Refinement Sockets, how you configure your optimal build, to even resolving a change of mind in what improvements you have is about giving you, the player options. We built the system, the choice is yours in how you use it. You can make anyone in the City of Titans. Written by Spiro 'Tannim222' Raxiotis, one of our power designers. Credit to Dony Armstrong for the icon designs and Jamie 'Geeksgonebad' Cunningham for capes, animation integration and buff girls. Web Developers (especially if you're versed in Drupal), Coders, and Clothing Modelers are heartily welcomed to help us make this happen. Use the contact form on the website or email contact-at-missingworldsmedia.com to tell us all about what you can do. Support the Official City of Titans Webcomic, Hijinx!